My own research is concerned with intellectual “fellow travelers” and although the term came in vogue to describe sympathizers of Communism in the United States, i.e. those who were not card-carrying members of the Communist Party but sympathized with some of its aims, the term can be similarly applied to Fascism and National Socialism during the 1930s. Usually the evidence is textual and well-hidden books and journals – all the more difficult to find as fellow travelers do everything they can to hide their past sympathies. Here is Dean Blayney in conversation with Nazi Minister of Technology and Education, Bernhard Rust. Courtesy Woodson Research Centre, Fondren Library, Rice University. Blaney after giving a congratulatory speech at the opening ceremony in Heidelberg city hall. According to local papers, Blayney's praise of the "newly awakened Germany" was enthusiastically received by the audience. Courtesy Woodson Research Centre, Fondren Library, Rice University. With Heidelberg notables and Nazi philosopher Ernst Krieck (?) in the background. Krieck was to succeed Wilhelm Groh as rector of Heidelberg University. His journal “Volk im Werden” is being distributed by a stormtrooper in the background. Courtesy Woodson Research Centre, Fondren Library, Rice University. These photographs led me to discover a case of intellectual fellow-traveling at Carleton that raises a number of difficult questions for the intellectual historian: Why would he mingle with these Nazis? Do they mean that Dean Blayney was a Nazi? Can Americans be Nazis? And what would this mean? 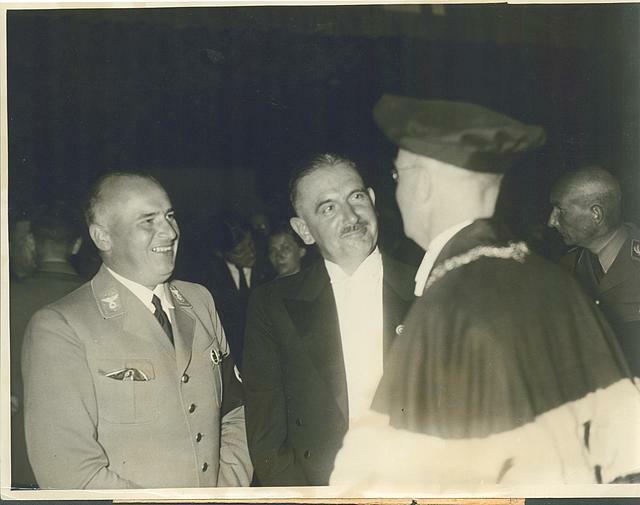 It turned out that these photographs were taken at the celebration of the University of Heidelberg 550 year anniversary, a Nazi-orchestrated propaganda event in the run-up to the Olympic Games in 1936. The celebrations were deemed by Hitler himself to be of national significance. He saw the potential for a substantial propaganda coup, presenting Germany as both a normal nation like any other as well as a pinnacle of academic research and culture to the outside world. So an appreciative international audience was critical to the success of the event. 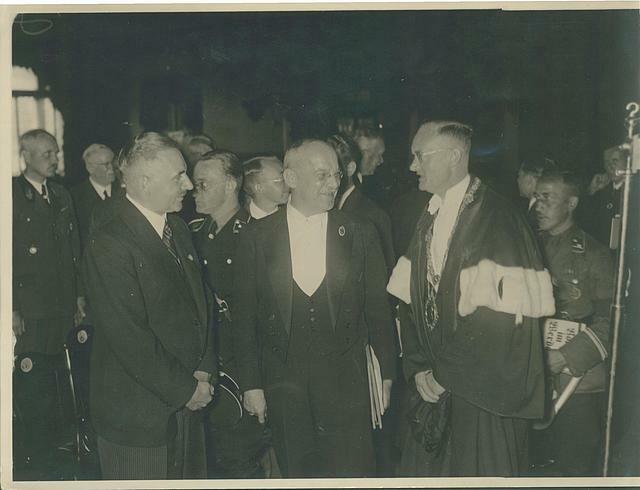 The event was a party affair entirely: Goebbels spoke at the opening, followed by Education Minister Bernhard Rust on "National Socialism and the Pursuit of Learning". Banners, flags, torches, storm-troopers underlined the strong connection between the regime and the university. As the newly installed Nazi president of the University, Wilhelm Groh noted on the occasion: "we feel the greatest joy that the old confrontation between politics and science has become irrelevant. For us, there is no tension between the intellectual work of the nation and its political way of life." This connection between University and regime had not escaped notice abroad where it was quickly noted that purpose of having foreign academics participate in the festivities was to lend international credibility to the Nazi regime. Moreover, American participation at the Heidelberg anniversary in 1936 had been at the heart of a heated national controversy about America’s relationship with Nazi Germany and, ultimately, about academia and politics. At Columbia, 1000 students and faculty members signed a petition demanding that the university not participate in the Heidelberg festival. On March 30th in the same year Blayney’s visit took place 200 students staged a mock book burning on campus, then proceeded to mansion of President Butler to hold a rally. Given all this controversy: What on Earth could have ridden the Dean of Carleton College to not only travel to Heidelberg in 1936 but to do so at the Head of the largest foreign delegation and, as it turned out, without being challenged by anyone, at least not publicly? Delving deeper into the details of the trip I discovered that Dean Blayney’s motives were a mixed bag between the ideological, the personal and the institutional. Taken individually, they were all perfectly innocent. Like many educated white Americans at the time Blayney was enthralled by the idea of an intellectual elite and of the mission of the liberal arts as forging a cultural elite. As Dean of Carleton College he regarded himself as a crucial part of this mission. He was no doubt impressed when Nazi minister Rust identified the task of Higher Education as the "spiritualization of the struggle" - that universities should serve the cultural mission of the nation and train an aristocracy of the spirit. Blayney himself said that "The college is democratic in so far as it opens its portals gladly to the sons of all classes who are capable of appreciating and making use of the training it gives. It is undemocratic, and there is no reason to hide the fact, in the sense that its graduates form the intellectual aristocracy of the country - an aristocracy of brains and ideals - of which even a democratic nation must be justly proud." Blayney also had important personal connections to the University of Heidelberg In his 20s he had undertaken a pilgrimage to Germany in the 1890s studying comparative literature at Heidelberg. During WWI he served he was part of the American occupying forces in the Rhineland, and ended up serving on the American consular staff into the early nineteen twenties, while completing a doctoral degree back at his Alma mater, Heidelberg, under the direction of Johannes Hoops, a noted German medievalist and conservative nationalist. So your doctoral supervisor asks you to take part in a jolly abroad, all expenses paid, connect with a few old friends, combined with a foreign holiday and some wine drinking. Why would you say no? Nothing wrong with that either – nothing obviously political about it. Yet Blayney was not only Dean of the college but also Head of the German Department. Then as now, the German program was extremely small, only intermittently boasting majors. Establishing and maintaining a student exchange program between Carleton College and the University of Heidelberg was one of his most important objectives. More importantly, in order to be even considered for graduate work in German at any of the major schools, an exchange year on Germany was a must. And what better place for it than Heidelberg? Student Exchanges, however, had to be reciprocal, especially in the case of Germany, as the severe shortage of foreign currency reserves as a result of the Great Depression and Nazi trade policies would have made an exchange without corresponding American funding impossible to finance. The precondition for sending students to Germany was inevitably the acceptance and funding of German students by Carleton. Any critique of the Nazi regime would have put this project in jeopardy – demonstrated by British Universities whose critique got them disinvited from the celebrations entirely. Blayney would never have dreamt of putting his pet project in jeopardy by causing political controversy. More likely, he would have jumped at the opportunity to renew his connections with Heidelberg and Higher Education officials sure to be present on this occasion. Although none of the motives by themselves are sufficient to accuse Thomas Blayney of intellectual fellow-travelling their combination should make us pause and reflect. Was it just an unfortunate combination of circumstances that led him to Heidelberg at the end of June 1936? I would argue that this was not the case: Blayney not only regarded the Nazi experiment as intellectually interesting but also, like many others, regarded New Deal America as a homologous case – a country that might benefit from selectively applying some of the lessons learnt, not least in realm of Higher Education. In addition Blayney created a discourse on campus that made it difficult if not impossible to criticize his engagement with Nazi Germany. By repeatedly arguing that politics and culture were strictly separate and by peddling a particular version of relativism that put the differences between dictatorship and democracy down to cultural differences entirely. “Our relationship with German Universities are strictly academic. 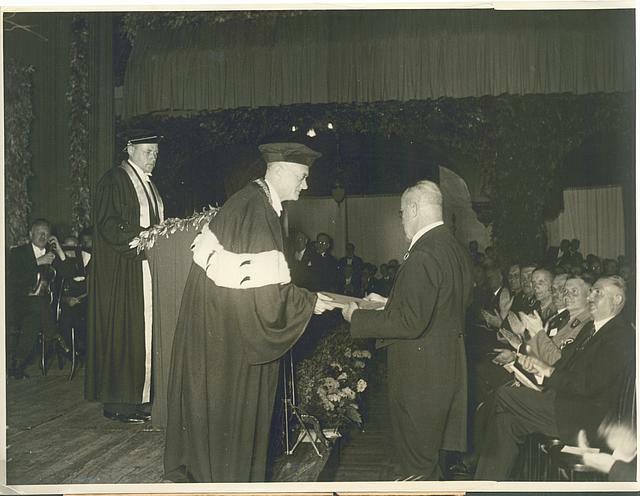 They have no political implications of any kind.” Following this sentiment, The Carletonian only noted only that "Dean Blayney was chosen by the delegates of 26 American colleges and universities to make the address of greeting and congratulation in behalf of the American delegation." 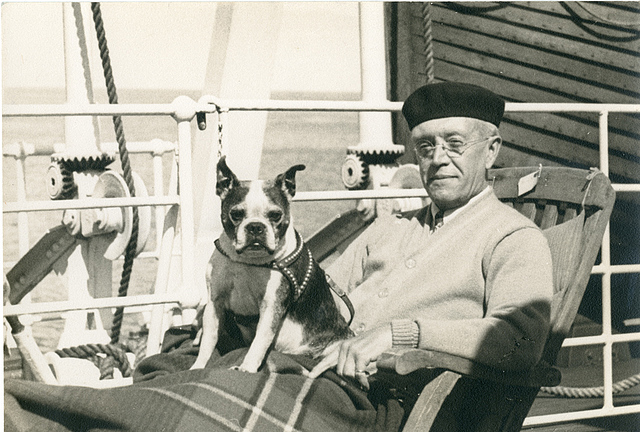 Far more publicity was given to the adventures of Blayney's dog Biddle as well as Blayney's visit to the last German Kaiser in his Dutch exile reportedly, "the greatest highlight of the trip." Courtesy Woodson Research Centre, Fondren Library, Rice University. Blayney also argued repeatedly that political regimes could only be judged by standards inherent to them. "If the American has a right to judge at all, he must judge German student life on German standards and not on American standards. Then he will find that student life there is fundamentally the same as at home. He will then be aware that international cooperation and good will, even in these days, can find expression where students from all nations meet in a spirit of tolerance and mutual understanding." The "national fervor" displayed by national socialism and its adherents was compared to the spirit inside a stadium during a collegiate football game: "The same kind of mob excitement which throbs in our university stadia can be felt in the great assemblies of students listening to speeches by their student party leaders or hearing the stirring oratory of the Reichchancellor, Adolf Hitler.” With remarks such as these Blayney created an atmosphere of political disengagement and political neutrality that easily masked what was an endorsement of political insstitutions and ideologies that others may have wanted to challenge. Join us as Carleton College celebrates its Sesquicentennial—150 years of proud history, academic achievement, growth, change, and community.